Here is another favorite kale recipe straight from Fat Free Vegan! If you are not familiar with Susan Voisin, please check out her blog. I've been following her for more than 5 years! She was the first blog I started following when I went vegan. I often hear from people who have recently tried kale that they think it is too "chewy" tasting. I guess when you compare it to cooked spinach that is true. But I don't have a recommendation for a recipe that will make it not chewy, except for maybe kale chips! Summer is approaching here in Florida, so we are starting to crave more cooling meals (at least for breakfast and lunch). I've been experimenting with Chia seeds for the past few months after coming across a brand of milled Chia seeds that did not need to be refrigerated. For years I was using flax seeds but Chia seems to have a higher nutrient profile that packs in protein with less fat. So I've been adding Chia to my oatmeal, smoothies, hydrating them with juice and drinking them, and using them as an egg replacement in baked recipes. Then along came a blog post from a blogger friend, Julie Cove, at Alkaline Sisters where she featured a beautiful Chia Breakfast Porridge. I have tried to make a Chia Porridge in the past and didn't find very appealing. I figured out from Julie's recipe that I was not adding enough milk. The seeds were coming out partially hydrated, so the porridge was very crunchy and actually caused me to have stomach cramps. Well, now I love this porridge! We were having it every day with whole Chia seeds until we ran out. Now Whole Foods is out of stock in their bulk section and in their Nutiva brand bags, and they are saying there is a shortage of supply, so they cannot say when they will get more! Wow! It figures the day I want to photograph the Chia for my blog, I have to use milled Chia. Well, I thought the milled version was okay, but my kids didn't like it. They said it was mushy. So, you will want to try this with the whole Chia seeds first. Pour milk into a small bowl and then add the and other ingredients. Stir with a small wisk for at least two minutes so that the chia begins to hydrate but doesn't become clumpy. Set in refrigerator for 2 hours or overnight. This can be enjoyed as a breakfast OR add more sweetener and enjoy as a dessert! If you've been following my blog you might have read one of my previous posts about how to make Almond Milk or Cashew Milk. We have a bit of a nut milk obsession in our house. And you know you can make milk out of ANY nut! I know, it's crazy!! I had not thought about making Pistachio milk until I was browsing through Chef AJ's book, Unprocessed. Chef AJ sent me a copy of her book back in January and I'm finally finding time to make more of the recipes in her book besides the Hail to the Kale salad. If you haven't tried that one yet, please do yourself and your family a favor and make it this week!! So the recipe for this in Unprocessed is 2 cups pistachios to 2 cups water. Soak the Pistachios in water for two hours before you blend. I didn't do that because I'm a recipe unfollower. I put 3/4 cup pistachios, 1/4 cup of almonds and threw them directly into the Vita-mix with 3 1/2 cups of water (I probably could have used 4). No soaking! Yeah, I know, I am a bad raw foodie today :( Well, I'm not a raw food purist anyway. See, I don't find any difference in taste or digestibility between soaking or not soaking before blending. So feel free to break the soaking rule and just blend! You can also use a fine mesh strainer instead of a nut milk bag but you will get some pulp. I almost forgot to mention that I also added 1 tbsp of Raw Blue Agave Nectar. I recommend adding the sweetener. Chef AJ didn't add any to hers but it needs it. See my other posts about making nut milks if you need more specific directions. Photographs can be like poetry. I love the way you can play with light and come up with an entirely different look of an object or group of objects. How the shadows fall creates a certain mood. These cherry tomatoes from our garden look pretty magnificent from this angle and in this light. When I first starting using the D50 on "Automatic" the photos were coming out really bad. I took it off the auto and went to 100% Manual and many of the photos were coming out slightly fuzzy. Now I shoot in manual and let the camera finesse the final focus. The more I use the camera, the more I am figuring out. My friend Kiran at Kirantarun.com blogged about her Fudgy Avocado Cocoa Brownies around St. Patrick's Day. So I was waiting on my avocados to ripen just so I could try this recipe. You know how I love green things, especially in desserts! And I love that there is no oil in this recipe, so at first glance I only needed to make two changes. I totally changed up this recipe to make it Gluten Free and Egg Free (so it's vegan) and had good results as far as fudgyness and texture. However, because I added extra avocado the brownies really tasted like avocado. My kids didn't seem to mind at all, they totally gobbled them up. But I think for others to appreciate them I really needed to make the brownies sweeter and maybe I should try using baking powder next time, haha! I will tell you about the changes I made (in case you really need to know) but I will need to make these a few more times and play with it more to get it right. Thankfully the recipe only makes about 6 average size brownies or 4 big brownies! First Use of My New Dutch Oven! As you know, I won a new Le Creuset dutch oven at the Orlando Food Blog Forum a few weeks ago. I have found several dutch oven recipes I want to try this month, but I needed to do something with four pounds of cherry tomatoes from our garden ASAP. So I decided on a simple, fat free, low sodium Cherry Tomato Sauce. And the dutch oven is perfect for this because it is non reactive with the tomatoes. All I did was add a finely chopped onion to the pan with two Rapunzel Vegan Broth Cubes and 1/4 cup water. Then I added 4 cloves of crushed garlic and the washed and lightly blended (in my Vitamix) cherry tomatoes. I brought them to a boil and then cooked on low heat for probably an hour and a half. I seasoned with 1/2 tsp of salt since we do low sodium. The recipe makes about 3 cups of sauce. These cherry tomatoes had a ton of little seeds. My husband and I didn't mind them but the kids were not enthusiastic. My oldest daughter thought the seeds made the sauce bitter and my youngest thought there should not be seeds in spaghetti sauce, so I guess I need to figure out how to strain these seeds the next time I make it. Anyone have any ideas for me? As mentioned in a previous post, I was at the Orlando Food Blog Forum a few weeks back. Well, in my "goodie bag" was an invite for me to attend the Downtown Food and Wine Festival! And since we've never been, I figured this was a great opportunity. As you can see from the over cast sky, it was on the verge of raining. And we weren't there long before it actually did rain! I stopped by the JW Marriott booth, not because I recognized my friend's husband Eric, who is the Executive Chef at the World Marriott, but because of the beautiful bottles of homemade pickles! My kids wanted to try a pickle, and when I went to ask, I said, "huh, I know this guy". And then we had to try the Broccoli Rabe sandwich. No, it wasn't on the menu, but Eric knows we're veg eaters so he made this one special for us. I had a few bites and then my kids devoured the rest. I guess I should have asked for two sandwiches! It doesn't look like much but peppers here but this was the best I could do for a photo with crowds of people walking around us. 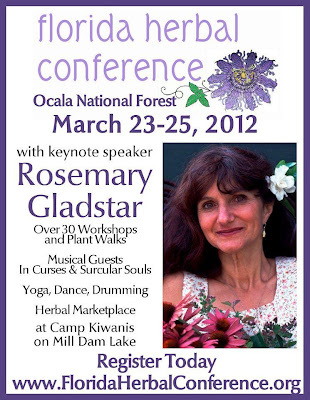 I had a great time last weekend at the Florida Herbal conference in the Ocala National Forest! I know some of you might be thinking...wasn't she at the Food Blog Forum the weekend before that? Two week ends in a row away from her family?! How could she? Well, we all should! Especially if you homeschool your kids like me :) It is hard to get away, but I have found I need to do it for my own sanity, so I seek out these educational trips and thankfully my parents can help out with watching the kids if my husband is traveling for his work. The first talk we listened to was called "Growing Herbs in Florida's Climate", led by Jim Steele, owner of The Herb Garden. What I learned from this talk is that herbs grow the best in spring and they do better in a cool, dry climate in general. I've been telling my husband not to use Miracle-Gro because it's not an organic fertilizer and I found out from Jim that it does nothing for the soil. It only makes the plant grow bigger in a short period of time but then you have to keep using it because the soil does not retain the nutrition from it. So if you use Miracle-Gro, please stop! Go buy organic potting soil or you can buy the individual nutrients and make your own organic soil. When I did a raised bed for a school garden project I just used Black Cow Cow Manure, Peet Moss, and Vermiculite. I wasn't there to water every day and the plants did well even though I planted them late in the season. There was no fruiting but they grew like crazy. My husband still thinks that I was lucky to have these results and he doesn't want to spend the money on raised beds with fancy soil so long as our garden is producing. There weren't enough chairs for me to sit in the shade so I ended up sitting on a pick-nick bench behind the tent. As you can see, we had a good size crowd just for this class. There were 5 classes happening in different parts of the camp simultaneously. Emily Ruff, who is the Director of the Florida School of Holistic Living and also the event manager for the Herbal Conference, was speaking about "Food as Medicine" in the photo below. She prepared several snacks made with herbs. One thing she mentioned that I had not thought of was putting green powders in applesauce! The sweetness of the applesauce hides the bitterness of the greens. I use apple juice with the green powders all the time for my kids, so now I will try it with the sauce. The last few photos are from the "Eat the Weeds Walk" with Deane Jordan. Most of the weeds he showed us would be something to sustain us should we be lost in the woods. I didn't take notes so I can't even tell you the names of the weeds below, but the pictures turned out really nice.